Louisiana has the highest incarceration rate of any U. S. state. Sentencing is extremely harsh. At the Louisiana State Penitentiary, also known as Angola (the name of the town where it is located), 73% of the 6,250 inmates are serving sentences of life without parole. The average sentence for the remaining 27% is 90.9 years. Prisoners are not even sent to Angola unless their sentence is over 50 years. The obvious result of this situation is that few who enter the gate will ever leave alive. At Angola 97% of the inmates die while incarcerated. An additional conundrum is that with sentences of this length, most inmates lose touch with family members and there is no one to collect their remains upon their death. 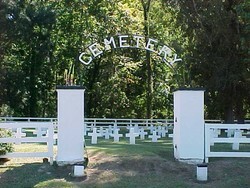 The first Angola cemetery was destroyed by a flood in 1927. When the water receded remains and caskets were found along the levy. As it was impossible to identify anyone, the bodies were reburied in a mass grave in a new cemetery named Point Lookout. It was about two acres and was full by the mid-1990s. It contained 331 marked graves and an unknown number of persons in the mass grave. An annex, Point Lookout II is now in use. It has a capacity of 700 plots. Approximately 100 of those graves now have been filled and with the aging inmate population, will likely max out in the not too distant future. Once convicts were interred in cardboard boxes. Today, thanks to Warden Cain, the deceased are buried in coffins made at the prison woodshop by an inmate master carpenter. These handmade caskets are constructed of brown stained birch and pine. It takes about a week to produce one. Other inmates make shrouds for the coffins.